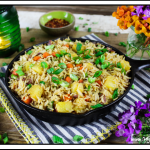 Vegan Pineapple Fried Rice ~ sweet, savory and spicy! So easy to make and takes 30 minutes on the stove. 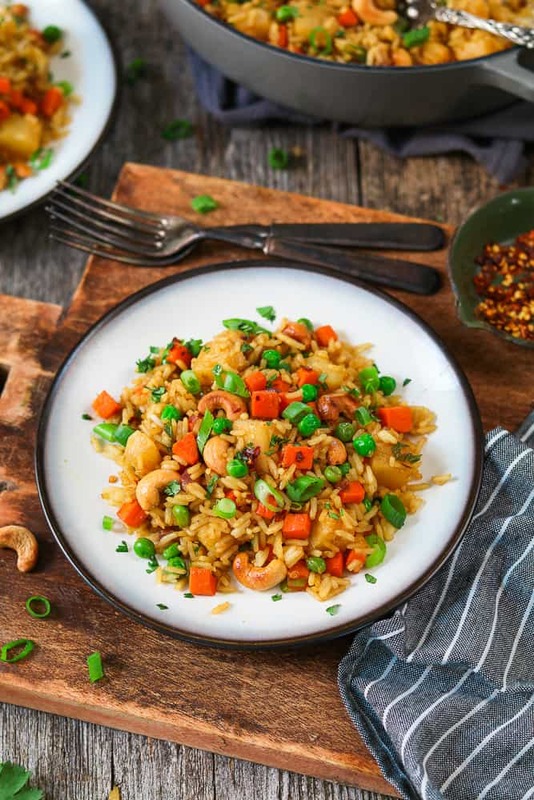 Some of you may recognize this Vegan Pineapple Fried Rice recipe already. 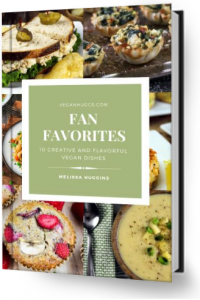 I originally published it in 2016 and it’s been a popular recipe on my site ever since. It’s also very popular in our house and it’s on heavy rotation along with my Potato Leek Soup and Avocado Black Bean Corn Salad. Well, I’ve made some small changes to the recipe over the years, and I think it’s time to share them. Along with fresh new photos, too! I wanted to make this more into a meal while still keeping the recipe simple. So, to make it more filling, I added frozen peas and roasted cashews. It adds extra protein and a variety of texture too. To amp up the savory flavor, I added Curry Powder and increased the amount of Tamari. If you thought this meal was addictive before, wait until you try it now. Curry powder for the win! I also amped up the ginger amount and added fresh-cut cilantro to the finished dish. It added a little more brightness and zest to the flavor profile. It’s mouth-watering good! I’m very happy with these subtle changes, and I hope you’ll love them too! STEP 1: Sauté the onions in oil until softened and slightly browned. STEP 2: Add carrots, crushed red pepper, ginger, and garlic. Sauté until carrots are tender. TIP: if food starts to stick to the pan, you can splash in a little vegetable broth to deglaze. STEP 3: Add pineapple chunks and sauté until slightly browned. STEP 4: Now add the rice, thawed peas, and green onion. 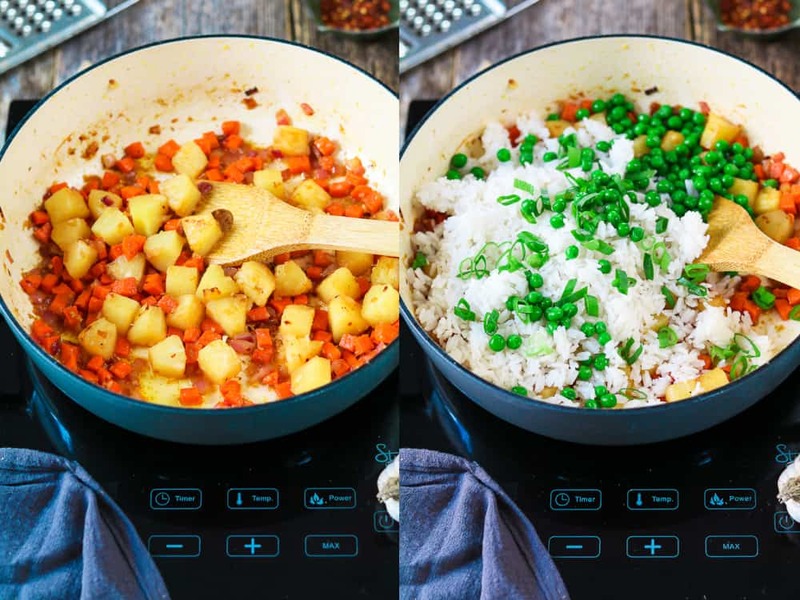 TIPS: this dish works best with cold, day-old rice because it’s drier than freshly cooked and it will keep a firmer texture. You can cook it the night before and refrigerate overnight (or at least 6-8 hours). 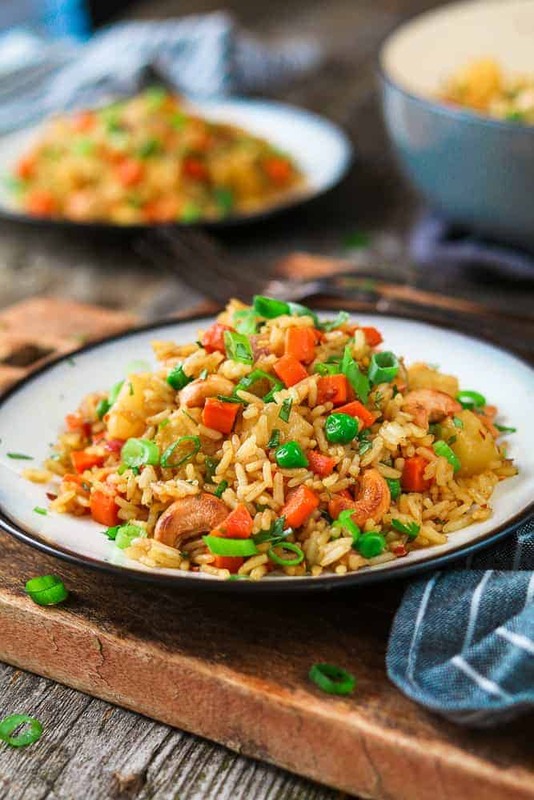 It will still be tasty if you haven’t chilled the rice, but the texture will be a lot softer than typical fried rice. STEP 5: Pour the tamari and curry powder mixture over the rice. Combine well and cook for 3-5 minutes until heated throughout. STEP 6: Taste for seasoning and add more if needed. STEP 7: Serve and top with green onions, fresh-cut cilantro, and roasted cashews. You can also add Sriracha for an extra kick! 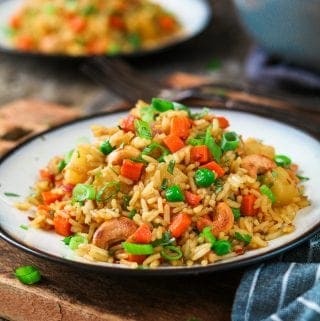 What’s the best rice to use for Pineapple Fried Rice? I like to use medium-long grain rice, but most will work fine. I’ll just use whatever I have available and this time I used Mahatma White Rice and it worked perfectly! 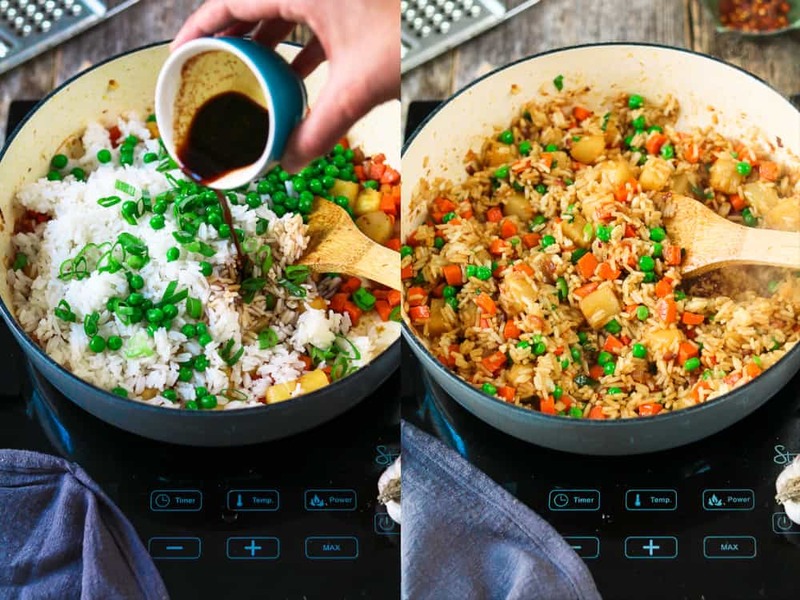 I found some great tips on prepping and storing rice in this article HERE. 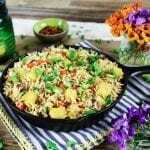 If you make this Vegan Pineapple Fried Rice, let me know what you think by ★ star rating it and leaving a comment below. It would really make my day. You can also follow me on Instagram and share your creation with me. Just tag me @veganhuggs and hashtag #veganhuggs so I don’t miss it. 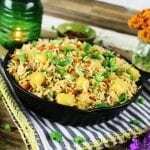 Vegan Pineapple Fried Rice ~ sweet, savory and spicy! So easy to make and takes 30 minutes on the stove. It's gluten-free too! Whisk the tamari and curry powder together. Set aside. 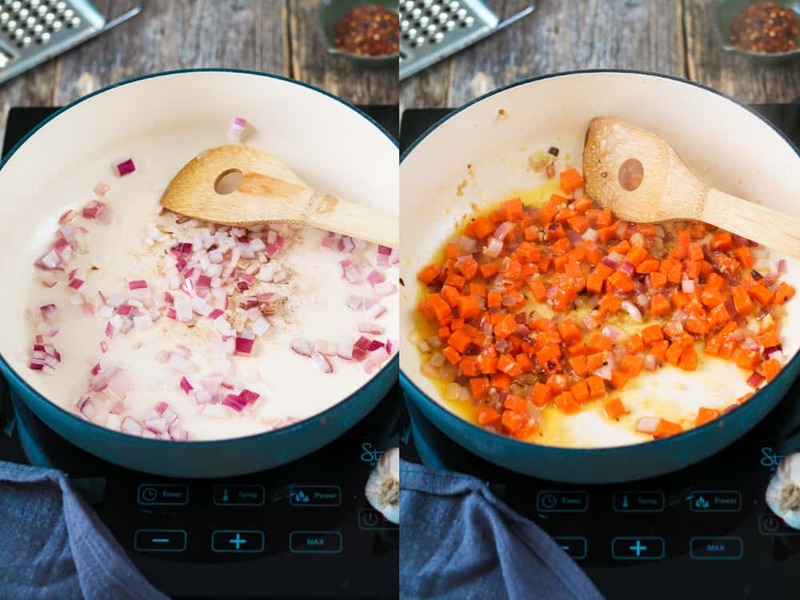 Heat coconut oil in a large pan or wok over medium heat. Add onions and sauté for 2-3 minutes, until softened. Add tamari, rice, peas and green onions. Stir frequently. Taste for seasoning and add more if needed. Cook about 4-5 minutes, until all ingredients are combined and heated through. Remove from heat and serve with optional toppings. Enjoy! 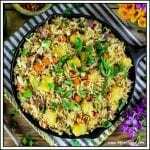 Very tasty Vegan Pineapple Fried Rice my favourite recipe thank.